C'est sûr que l'enthousiasme est un peu redescendu, l'effet nouveauté arrivant à son terme. 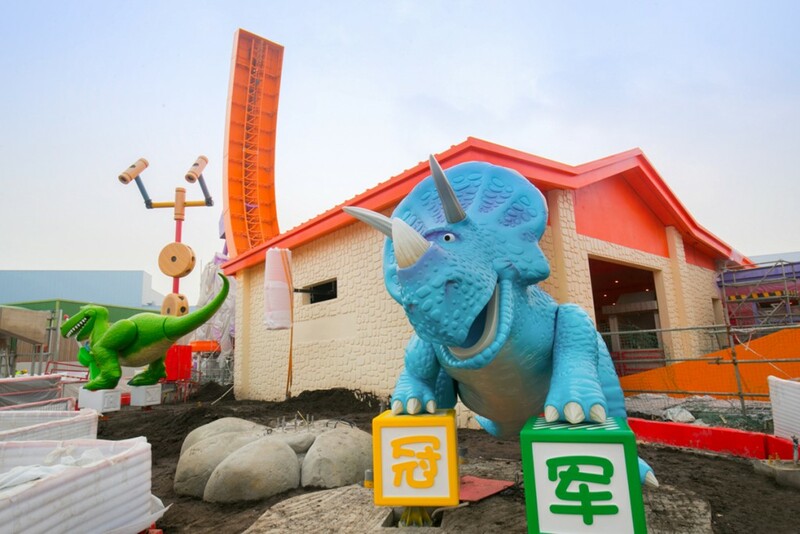 Et je ne trouve pas que Toy Story Playland version chinois soit un projet à la mesure pour une première extension. C'est assez réduit comme ambition. Ceci dit c'est peut être qu'un projet intermédiaire. Peut être que Gas va mettre Indiana Jones Adventure qu'il voulait pour Paris à Shanghai ^^. One of The Walt Disney Company’s most popular franchises will have an even bigger presence at Shanghai Disney Resort’s theme park, Shanghai Disneyland, when the park expands to include its 7th themed land. Shanghai Disney Resort today revealed details of the highly anticipated Disney Toy Story Land, the first post-opening expansion of the resort. The new land will feature attractions and entertainment celebrating fun and imagination for guests of all ages, and provide yet another reason for them to be immersed in the unparalleled storytelling and creativity of Shanghai Disneyland for multiple-day visits. 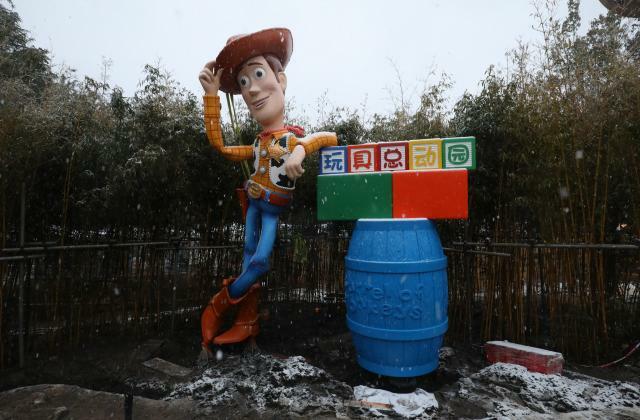 Disney Toy Story Land is a sign of the early success of Shanghai Disney Resort, and demonstrates the confidence the joint venture shareholders have in the growing consumer demand for themed entertainment in China. 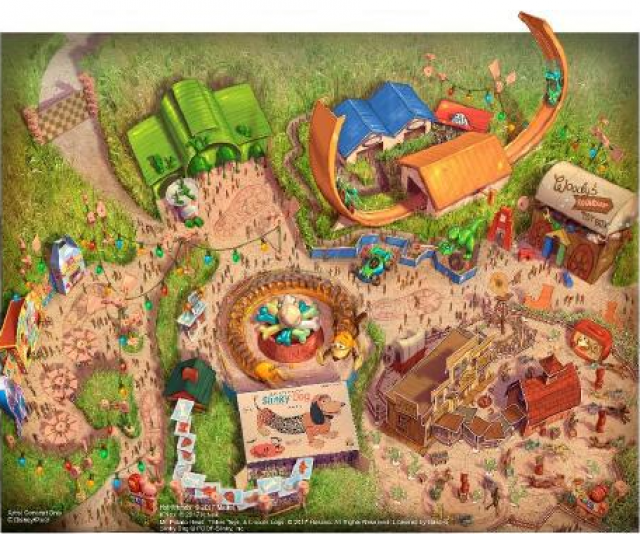 Based on the Disney·Pixar motion picture series, Disney Toy Story Land will be a high-spirited, colorful world where guests will feel as if they’ve been shrunk down to the size of their favorite Toy Story toys for laughter and fun with family and friends in the backyard of Andy, the boy from the movies. Woody, Buzz and their Toy Story friends come to life and play in this fully immersive land, which features three new attractions and a uniquely themed character greeting area. Rex’s Racer : Rex, Andy’s insecure Tyrannosaurus Rex toy enjoys playing with RC Racer almost as much as he likes playing video games. With help from his Triceratops friend Trixie, Rex will invite guests to climb into RC for a thrilling ride on the U-shaped track. With Rex at the controls, RC Racer, with guests aboard, zips forward and backward at ever increasing heights and exhilarating speed. Woody’s Round-Up : Sheriff Woody has rounded up a herd of ponies, each one pulling a cart, in a ranch set up by Andy. Guests can climb aboard the carts as the ponies start a little square dance swinging their carts to and fro in time to the lively music. Meeting Post : Next to Woody’s Round-Up is Old West, a town made up of a hitching post and façades for various enterprises, such as the sheriff’s office, the saloon and the bank. Here, guests can meet and pose for photos with some of their favorite Toy Story characters, including Woody, Jessie and Bullseye. Shanghai Disney Resort - 30 novembre 2017. Tu ma doublé Vinc ! Cela va être génial et moi aussi rc racer me parait plus grand. Je crois que RC est le même ! C'est un modèle sélectionné par Disney depuis le premier construit ! Quel dommage de refaire un land Toy Story alors qu'il en existe un à Hong-Kong, meme si il y a des différences. Ces deux resorts doivent pour moi jouer la complémentarité par rapport à leur proximité! C'est pas ambitieux comme nouveauté post-ouverture! Mais bon ca fera l'affaire. C'est officiel, le land ouvrira le 26 avril 2018! 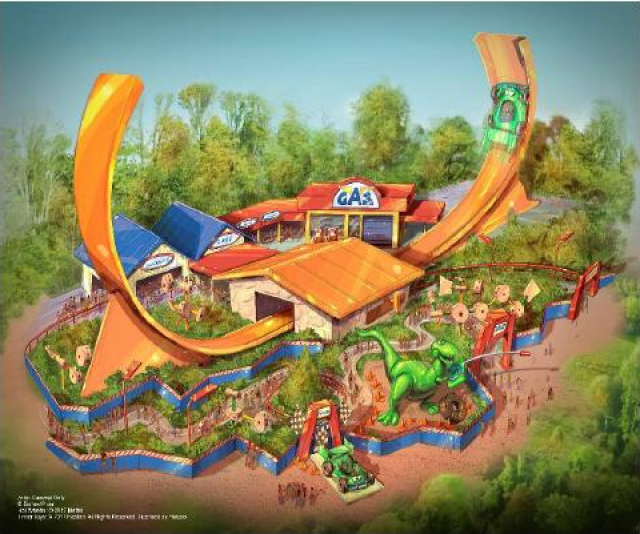 Based on the Disney·Pixar film series, Disney Toy Story Land will be a high-spirited, colorful world where guests will feel as if they’ve been shrunk down to the size of their favorite Toy Story toys for laughter and fun with family and friends. Woody, Buzz and their Toy Story pals come to life and play in this fully immersive land, which features three new attractions – Slinky Dog Spin, Rex’s Racer, Woody’s Round-Up, a uniquely themed character greeting area, Meeting Post, and immersive shopping and dining experiences, Al’s Toy Barn and Toy Box Café. Shanghai Disney Resort - 7 décembre 2017. Il parait vraiment plus grand rc racer. C'est au cause de la prise de vue de la photo .Mais c'est bien le même que le notre . Dans l'article, il parle de 400 jouets géants dissimulés dans le land ,ça va être bien décoré ce land . Les premiers personnages ont été installés devant Rex's Racer. Two of our favorite Toy Story characters made their debut at Shanghai Disneyland this week: Rex and Trixie! These beloved dinosaur toys from the popular Disney·Pixar film series will appear as part of Rex’s Racer at Disney·Pixar Toy Story Land when it opens in just a few months. 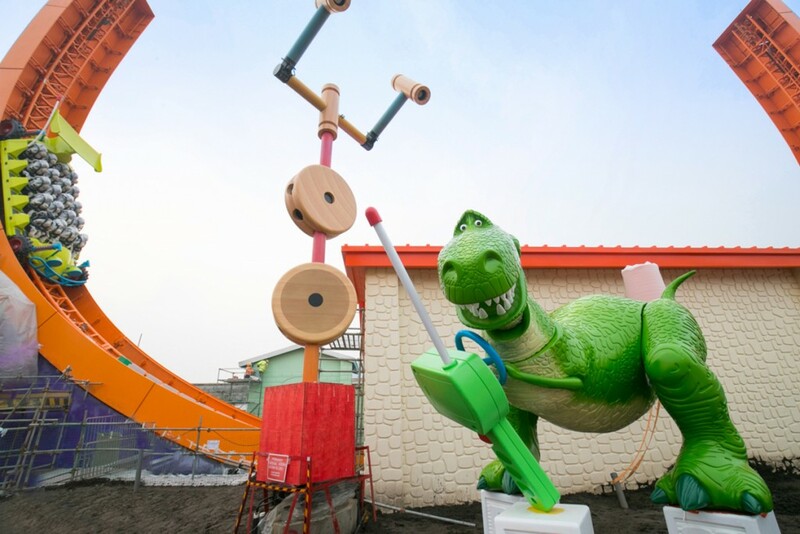 Rex’s Racer is one of three major attractions coming to Disney·Pixar Toy Story Land, the first expansion project at Shanghai Disney Resort since opening in 2016. 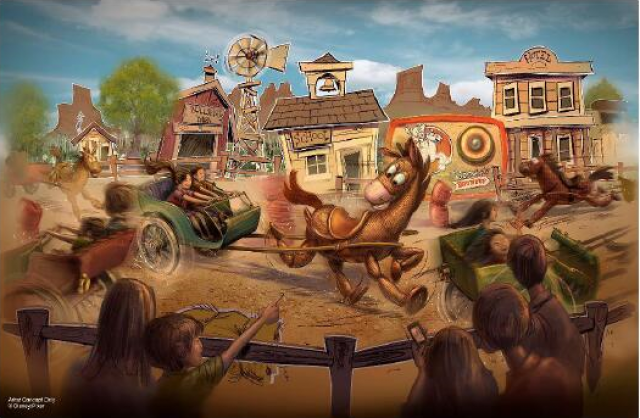 This seventh themed land will shrink guests down to the size of their favorite Toy Story characters and invite everyone into Andy’s backyard for an unforgettable adventure. In addition to Rex’s Racer, guests can also enjoy Slinky Dog Spin and Woody’s Round-Up, say hi to Andy’s toys at Meeting Post, shop at Al’s Toy Barn and dine inside Toy Box Café for an exciting and immersive day of play. The land will officially open on April 26! Stay tuned for more Disney·Pixar Toy Story Land updates right here on the Disney Parks Blog. Disney Parks Blog - 11 janvier 2018. Shanghai Disney Resort -11 janvier 2018. Pour être complet, le communiqué de presse présente une troisième photo (fort similaire à la première photo postée par NAIROLF). en capacité, ça va pas être jojo. Les studios ont frolé les 5 millions en 2016, et en 2017 les ont surement bien dépassés. Pour Shanghai, ayant fait le parc, il est quand meme trés étendu et hors vacances les temps d'attente sont très raisonnables. Mais oui un mini land à si petite capacité, ce n'est peutetre pas la meilleure idée. A croire que John Lasseter a fait le forcing pour avoir ce land partout (et toucher plus de royalties peutetre), seul le Japon réasiste pour le moment. J'ai hate par contre de savoir quelles seront les nouveautés suivantes même si on risque d'attendre un peu. Woody is Andy’s favorite cowboy toy who has been a leading character in all three Toy Story films. As the toys' leader, and despite his fears to the contrary, he's always been Andy's favorite—no matter what new toys enter the picture. First appearing in Toy Story 2, Jessie is a rough-and-tumble cowgirl with a passion for yodeling. Since being abandoned by her original owner, she is sensitive to being left behind; however, she's also an incredibly optimistic member of Andy's toy gang. As a fully immersive land, the two remarkable icons, Woody and Jessie, are built to be 4.5 meters and 3.5 meters tall respectively to allow guests to feel as if they’ve been shrunk down to the size of the Toy Story toys in Andy’s backyard. 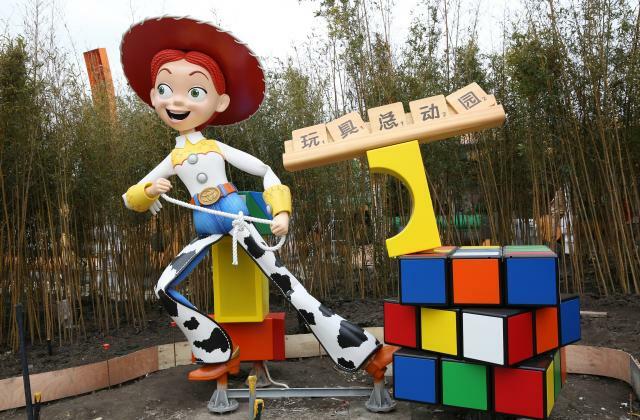 The installation of Woody and Jessie, the two tallest icons at Disney • Pixar Toy Story Land in Shanghai, marked a significant construction milestone in the land’s development and a major step forward towards its opening. After breaking ground in November 2016, the land has celebrated numerous milestones, including the successful installation of the track for the new Rex’s Racer attraction and multiple icons such as Mr. and Mrs. Potato Head, Rex and Trixie, as well as ride vehicle load-in. With major construction of Disney • Pixar Toy Story Land close to completion, the land is now entering an extensive preparation period including attraction test and adjustment and Cast recruitment and training, to ensure Woody, Jessie and all of their Toy Story friends are ready to greet their first official guests in April. 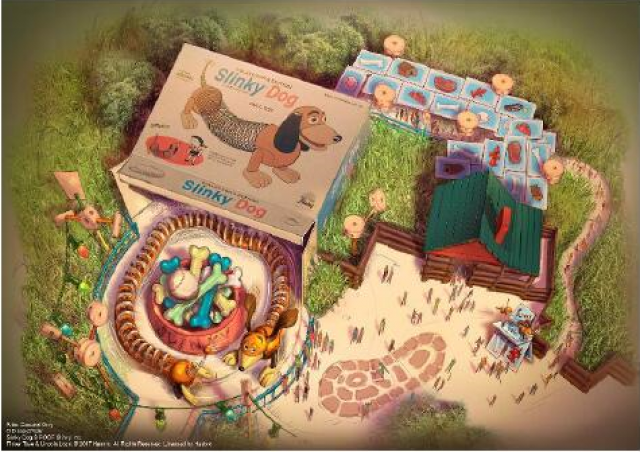 The brand new Disney • Pixar Toy Story Land will feature three new attractions, Slinky Dog Spin, Rex’s Racer and Woody’s Round-Up, and a uniquely themed character greeting area. Guests can also extend their experience with fun, immersive shopping and dining opportunities in Al’s Toy Barn and Toy Box Café. Characters and stories from the Toy Story franchise have strongly resonated with Chinese guests. Shanghai Disney Resort has already been immersing guests in the world of toys since opening, with the only Toy Story-themed hotel in the world, as well as multiple Toy Story-themed attraction, entertainment and merchandise offerings. Today, guests can join a mission to help save the day on the Buzz Lightyear Planet Rescue attraction, or meet Woody, Buzz, Rex, and the adorable Slinky Dog on the Toy Story float in Mickey’s Storybook Express. Guests can also bring their favorite Toy Story toys, including Woody, Jessie, Buzz, Slinky Dog, Aliens and the most huggable bear – Lotso home after shopping at Avenue M Arcade. Shanghai Disney Resort - 30 janvier 2018.